Better Buy Certified Used Car Spring Clearance Sales Event! The Better Buy Certified Used Car Spring Clearance Sale has begun at Wetzel Auto! There are savings to be had, and dream cars to be found. But, what makes a Better Buy Certified Used Car different from your standard pre-owned vehicle? We Check ’em Better! We Back ’em Better! We Price ’em Better! Every Better Buy Used Car has been thoroughly inspected and reconditioned by ASE certified technicians so it feels like new. This gives you peace of mind knowing that the pre-owned vehicle you’re purchasing is in top condition. Engine: engine performance, emissions controls, vacuum hoses, oil pressure, motor mounts, exhaust, spark plugs, secondary emissions system, catalytic converter. Transmission: fluid, shift points, slipping, transmission mounts, noise, clutch operation, 4WD operation, leakage, hoses/lines, modulator, linkages. Suspension: frame integrity, ball joints, tires/wheels, spring/torsion bars, sway bar links, bushings, MacPherson struts. Body/Interior: carpet, upholstery, trim, hood latches, trunk release, fuel door release, paint. Steering: tie rods. idler arms, center links, power steering pump, hoses/lines, shaft/couplings, alignment. Cooling: radiator, coolant, radiator/heater hoses, recovery system, cooling fan, belts. Heating & A/C System: compressor, condenser, evaporator, hoses and lines, refrigerant level, cooling fan. *Terms and Conditions for Buyback Guarantee apply. Wetzel Auto is also endorsed by AAA as Auto Buying and Car Repair Company. What does it mean to by endorsed by AAA? AAA recognizes our commitment to our customer satisfaction and vehicle quality. We are the only dealer in the area to meet AAA’s strict guidelines. The Wetzel Auto Group is committed to your satisfaction. If at any time during the first 3 days of 300 miles that you own your vehicle, you are not satisfied, simply bring the vehicle back to us and exchange it for a vehicle of equal value. Better Buy is more than a name. It represents quality. We understand how frustrating car repairs can be. Especially when those repairs come shortly after you have purchased a vehicle. That is why all Better Buy Used Cars come with a minimum 12 month or 12,000 mile limited powertrain warranty. Due to the volume of our business, we are able to offer our customers financing options that are custom-tailored to their needs. Whether you face credit related challenges or simply want the best rate possible, we can help! Financing a pre-owned vehicle has never been easier. We have dedicated individuals searching the entire for the highest quality, lowest priced vehicles for our inventory. In today’s competitive market we are constantly monitoring vehicle values to ensure we are offering the best prices possible. We are still with you after the sale. Here at the Wetzel Auto Group, we believe very strongly in building life-long relationships with our customers. That is why we are here for you long after the purchase of your Better Buy Certified Used Car. Our 12 month 12,000 mile warranty offers many luxuries such as: 12 months of 24 hours roadside assistance, towing, jump starts, flat tire changes, concierge service, Saturday and evening service hours, and free shuttle services. All Better Buy Used Cars qualify for the Better Buy Advantage. The Better Buy Advantage is a vehicle service contract plan that provides you with comprehensive coverage to protect your investment. The Better Buy Advantage will pay 100% of the repair cost of any covered component less your deductible. When we say it’s comprehensive, we mean it. Covered component groups are: engine, transmission, front/rear wheel drive, electrical, fuel system, cooling system, air conditioning, brakes, front suspension, and steering. Buy your next pre-owned vehicle with confidence during the Better Buy Certified Used Car Spring Clearance Sale! Recent Arrival! **CLEAN CARFAX**, IMMACULATE CONDITION, NON SMOKER, Locally Owned New Car Trade!, Power Moonroof, 4.0L, TOW, 2-Line Message Center w/Compass, 4 Speakers, 4-Wheel Disc Brakes, ABS brakes, Air Conditioning, AM/FM radio, AM/FM Stereo w/Single CD/MP3 Player, Automatic Headlamps, CD player, Convenience Group, Dual front impact airbags, Dual front side impact airbags, Electrochromic Mirror, Electronic Stability Control, Four wheel independent suspension, Front anti-roll bar, Front fog lights, Keyless Entry w/Keypad, Leather-Trimmed Low-Back Sport Buckets, Low tire pressure warning, Mini Overhead Console, Occupant sensing airbag, Overhead airbag, Panic alarm, Passenger door bin, Power door mirrors, Power driver seat, Power Moonroof w/Shade, Power steering, Power windows, Radio data system, Rear anti-roll bar, Rear window defroster, Remote keyless entry, SIRIUS Satellite Radio w/60S, Speed control, Steering wheel mounted audio controls, Sun & SIRIUS Package, Traction control. Clean CARFAX. 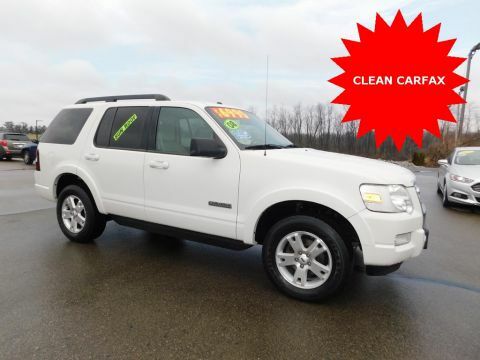 Oxford White Clearcoat 2008 Ford Explorer XLT 4D Sport Utility RWD 5-Speed Automatic 4.0L V6 12V Awards: * 2008 KBB.com 10 Best Used SUVs Under $10,000 * 2008 KBB.com Brand Image Awards Full tank of gas, full detail, 3 day satisfaction guarantee. Recent Arrival! **CLEAN CARFAX**, Locally Owned New Car Trade!, Power Moonroof, Ash Cloth, 4-Wheel Disc Brakes, 6.5JJ x 16" Steel Wheels, ABS brakes, Air Conditioning, Brake assist, CD player, Dual front impact airbags, Dual front side impact airbags, Dual Illuminated Visor Vanity Mirrors, Electronic Stability Control, Four wheel independent suspension, Front anti-roll bar, Illuminated entry, Knee airbag, Low tire pressure warning, Moonroof Package, Occupant sensing airbag, Overhead airbag, Panic alarm, Power driver seat, Power steering, Power windows, Radio: AM/FM CD Player w/MP3/WMA Playback Capable, Rear anti-roll bar, Rear Personal Reading Lights, Remote keyless entry, Speed-sensing steering, Steering wheel mounted audio controls, Traction control. Clean CARFAX. Magnetic Gray Metallic 2011 Toyota Camry LE 4D Sedan FWD 6-Speed Automatic Electronic with Overdrive 2.5L I4 SMPI DOHC Awards: * JD Power Dependability Study * 2011 KBB.com 10 Best Used Family Cars Under $15,000 * 2011 KBB.com Brand Image Awards Full tank of gas, full detail, 3 day satisfaction guarantee. Recent Arrival! 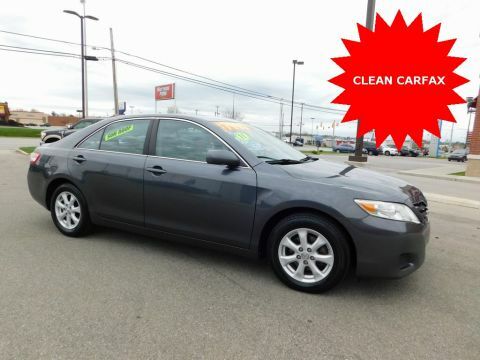 **LOW MILEAGE**, PREMIUM SOUND SYSTEM, Gray w/Cloth Seat Trim, Alloy wheels, Power moonroof. 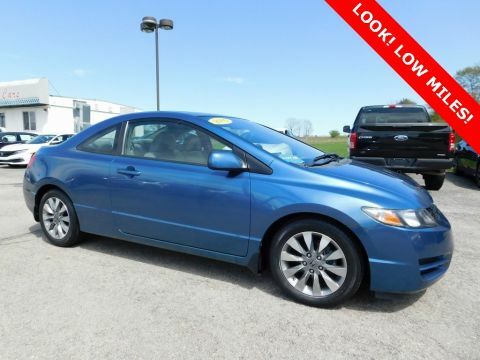 Atomic Blue Metallic 2009 Honda Civic EX 2D Coupe FWD 5-Speed Manual 1.8L I4 SOHC 16V i-VTEC Odometer is 46610 miles below market average! 26/34 City/Highway MPG Why buy a Wetzel Better Buy Used Vehicle? We Check ‘em Better with a certified 160-Point Vehicle Inspection by an ASE Certified Technician. We provide Carfax Vehicle History Reports, and are endorsed by AAA. We Back ‘em Better with a 3 Day Satisfaction Guarantee. We Price ‘em Better with Certified Preferred Financing and Guaranteed Credit Approval. We have dedicated individuals searching the country for the highest quality, lowest priced vehicles for our inventory. Bad credit, no credit we have guaranteed financing! 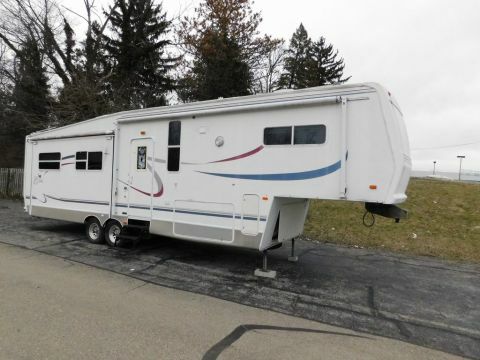 Call for more information regarding the vehicle at 765-966-7000. Awards: * 2009 KBB.com Best Resale Value Awards For more information, visit www.kbb.com. Kelley Blue Book is a registered trademark of Kelley Blue Book Co., Inc. Recent Arrival! **CLEAN CARFAX**, IMMACULATE CONDITION, NON SMOKER, **LOADED!! **, Locally Owned New Car Trade!, 4-Wheel Disc Brakes, 8 Speakers, Air Conditioning, Alloy wheels, AM/FM radio, CD player, Dual front impact airbags, Front anti-roll bar, Front wheel independent suspension, Illuminated entry, Occupant sensing airbag, Panic alarm, Power driver seat, Power steering, Power windows, Premium audio system: Shaker 500, Radio data system, Rear window defroster, Remote keyless entry, Shaker 500 AM/FM Stereo w/In-Dash CDx6/MP3, Speed control. Clean CARFAX. 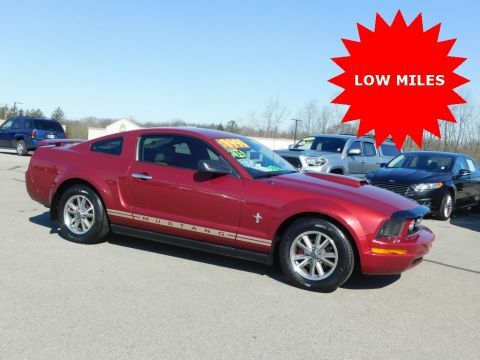 Redfire Clearcoat Metallic 2005 Ford Mustang V6 Premium 2D Coupe RWD 5-Speed Manual with Overdrive 4.0L V6 SOHC 19/28 City/Highway MPG Full tank of gas, full detail, 3 day satisfaction guarantee. **CLEAN CARFAX**, IMMACULATE CONDITION, NON SMOKER, Locally Owned New Car Trade!, 3rd row seats: split-bench, 4.375 Axle Ratio, 4-Wheel Disc Brakes, 7 Speakers, ABS brakes, Air Conditioning, Alloy wheels, Brake assist, CD player, Dual front impact airbags, Dual front side impact airbags, Electronic Stability Control, Front anti-roll bar, Low tire pressure warning, Occupant sensing airbag, Overhead airbag, Panic alarm, Power steering, Power windows, Radio: AM/FM/6-Disc In-Dash/XM Satellite, Rear anti-roll bar, Remote keyless entry, Speed control, Steering wheel mounted audio controls, XM Satellite Radio. Clean CARFAX. 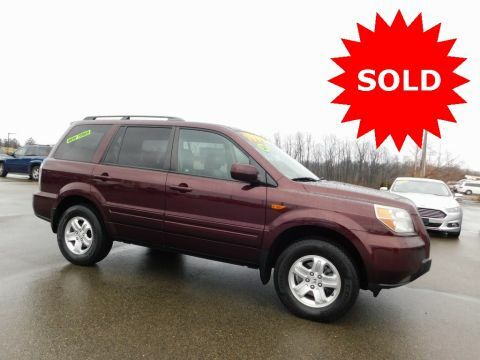 Dark Cherry Pearl 2008 Honda Pilot VP 4D Sport Utility FWD 5-Speed Automatic 3.5L V6 SOHC i-VTEC 24V Odometer is 20083 miles below market average! Awards: * 2008 KBB.com Brand Image Awards 2016 Kelley Blue Book Brand Image Awards are based on the Brand Watch(tm) study from Kelley Blue Book Market Intelligence. Award calculated among non-luxury shoppers. For more information, visit www.kbb.com. Kelley Blue Book is a registered trademark of Kelley Blue Book Co., Inc. Full tank of gas, full detail, 3 day satisfaction guarantee. Recent Arrival! CARFAX One-Owner. 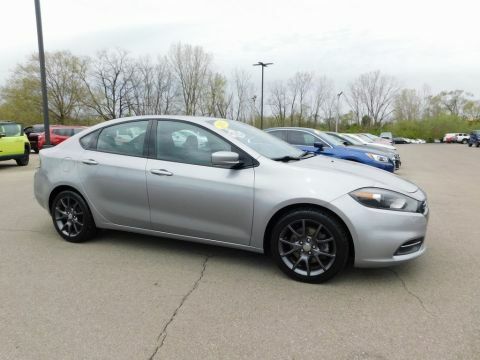 Billet Silver Metallic Clearcoat 2015 Dodge Dart SE 4D Sedan FWD 6-Speed Automatic 2.0L I4 DOHC Odometer is 4065 miles below market average! 24/34 City/Highway MPG Awards: * 2015 IIHS Top Safety Pick * 2015 KBB.com 10 Best UberX Candidates * 2015 KBB.com 10 Tech-Savviest Cars Under $20,000 Why buy a Wetzel Better Buy Used Vehicle? We Check ‘em Better with a certified 160-Point Vehicle Inspection by an ASE Certified Technician. We provide Carfax Vehicle History Reports, and are endorsed by AAA. We Back ‘em Better with a 3 Day Satisfaction Guarantee and a 12 Month/12,000 Mile Warranty. We Price ‘em Better with Certified Preferred Financing and Guaranteed Credit Approval. We have dedicated individuals searching the country for the highest quality, lowest priced vehicles for our inventory. Recent Arrival! 4WD. Priced below KBB Fair Purchase Price! Brilliant Black Crystal Pearl 2011 Dodge Nitro Heat 4D Sport Utility 4WD 4-Speed Automatic VLP 3.7L V6 Odometer is 14291 miles below market average! Why buy a Wetzel Better Buy Used Vehicle? We Check ‘em Better with a certified 160-Point Vehicle Inspection by an ASE Certified Technician. We provide Carfax Vehicle History Reports, and are endorsed by AAA. We Back ‘em Better with a 3 Day Satisfaction Guarantee and a 12 Month/12,000 Mile Warranty. We Price ‘em Better with Certified Preferred Financing and Guaranteed Credit Approval. We have dedicated individuals searching the country for the highest quality, lowest priced vehicles for our inventory. Recent Arrival! IMMACULATE CONDITION, NON SMOKER, Locally Owned New Car Trade!, Power Moonroof, 3.195 Axle Ratio, 4-Wheel Disc Brakes, 4-Wheel Disc Brakes w/ABS, 4-Wheel Independent Suspension, 6 Speakers, 60/40 Split Fold-Down Rear Seatback, ABS brakes, Advanced Front Airbags, Air Conditioning, Alloy wheels, AM/FM radio, Anti-whiplash front head restraints, Brake assist, CD player, Dual front impact airbags, Dual front side impact airbags, Electronic Stability Control, Electronic Stability Control w/Traction Control System, EZ Lane Change Assist, Four wheel independent suspension, Front anti-roll bar, Hillstart Assist Control (HAC), Low tire pressure warning, Motor Driven Power Steering, MP3 decoder, Occupant sensing airbag, Overhead airbag, Panic alarm, Power Door & Liftgate Locks, Power steering, Power windows, Radio: Autonet AM/FM/CD/MP3 Audio System, Rear anti-roll bar, Rear window defroster, Remote keyless entry, Remote Keyless Entry System w/Alarm, Security system, Speed control, Speed-sensing steering, Steering wheel mounted audio controls, Steering-Wheel Mounted Audio & Cruise Controls, Tire Pressure Monitoring System, Traction control. 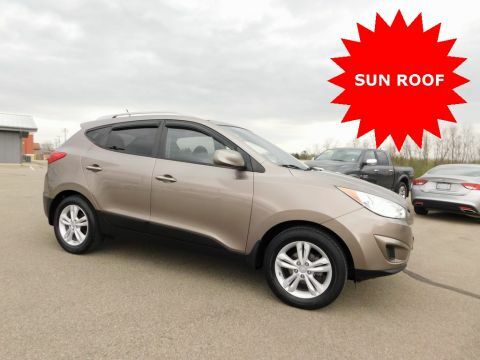 Chai Bronze 2011 Hyundai Tucson GLS 4D Sport Utility FWD 6-Speed Automatic with Overdrive 2.4L I4 MPI DOHC CVVT 16V Theta 2 Odometer is 14527 miles below market average! 22/31 City/Highway MPG Full tank of gas, full detail, 3 day satisfaction guarantee. Recent Arrival! IMMACULATE CONDITION, BLUETOOTH HANDS FREE, NON SMOKER, **LOADED!! 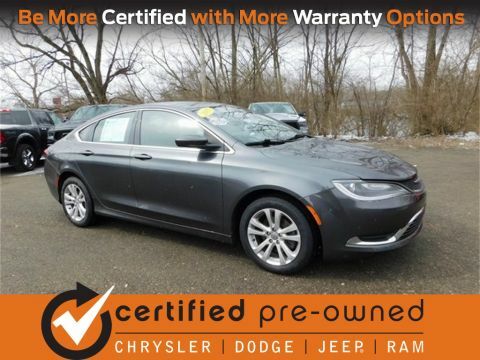 **, Locally Owned New Car Trade!, Heated Leather Seats, Navigation/NAV/GPS, Power Moonroof, Back Up Camera, HEMI, HEMI 5.7L V8 Multi Displacement, 4WD, 3.73 Axle Ratio, 4-Wheel Disc Brakes, 6 Speakers, ABS brakes, Air Conditioning, AM/FM radio: SIRIUS, Audio memory, Automatic temperature control, Brake assist, CD player, Dual front impact airbags, DVD-Audio, Electronic Stability Control, Front anti-roll bar, Front dual zone A/C, Front wheel independent suspension, Low tire pressure warning, Memory seat, MYGIG Multimedia System w/SIRIUS, Normal Duty Suspension, Occupant sensing airbag, Overhead airbag, Panic alarm, Pedal memory, Power driver seat, Power moonroof, Power steering, Power windows, Radio data system, Rear anti-roll bar, Rear window defroster, Remote keyless entry, Security system, Speed control, Steering wheel mounted audio controls, Traction control. 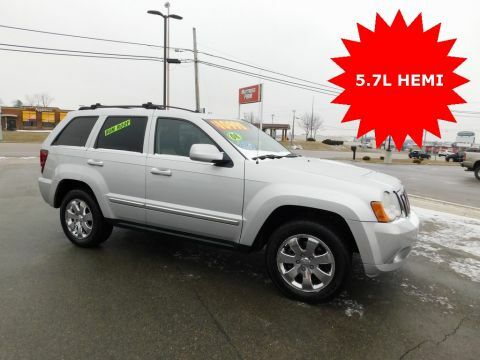 Bright Silver Metallic 2008 Jeep Grand Cherokee Limited 4D Sport Utility 4WD 5-Speed Automatic HEMI 5.7L V8 Multi Displacement Odometer is 24129 miles below market average! Full tank of gas, full detail, 3 day satisfaction guarantee. Recent Arrival! Cloth. Crimson Pearl 2014 Honda Civic LX 4D Sedan FWD CVT 1.8L I4 SOHC 16V i-VTEC Odometer is 33635 miles below market average! 30/39 City/Highway MPG Awards: * 2014 IIHS Top Safety Pick+ * 2014 KBB.com Brand Image Awards 2016 Kelley Blue Book Brand Image Awards are based on the Brand Watch(tm) study from Kelley Blue Book Market Intelligence. Award calculated among non-luxury shoppers. For more information, visit www.kbb.com. Kelley Blue Book is a registered trademark of Kelley Blue Book Co., Inc. Why buy a Wetzel Better Buy Used Vehicle? We Check ‘em Better with a certified 160-Point Vehicle Inspection by an ASE Certified Technician. We provide Carfax Vehicle History Reports, and are endorsed by AAA. We Back ‘em Better with a 3 Day Satisfaction Guarantee and a 12 Month/12,000 Mile Warranty. We Price ‘em Better with Certified Preferred Financing and Guaranteed Credit Approval. We have dedicated individuals searching the country for the highest quality, lowest priced vehicles for our inventory. Recent Arrival! 6-Speed Automatic. Charcoal 2013 Ford Fusion SE 4D Sedan FWD 6-Speed Automatic EcoBoost 2.0L I4 GTDi DOHC Turbocharged VCT Odometer is 19150 miles below market average! 22/33 City/Highway MPG Awards: * Ward's 10 Best Engines * 2013 KBB.com Best Resale Value Awards * 2013 KBB.com 10 Best Family Cars * Green Car Journal 2013 Green Car of the Year * 2013 KBB.com 10 Best New Sedans Under $25,000 * 2013 KBB.com Brand Image Awards Based on 2017 EPA mileage ratings. Use for comparison purposes only. Your mileage will vary depending on how you drive and maintain your vehicle, driving conditions and other factors. Why buy a Wetzel Better Buy Used Vehicle? We Check ‘em Better with a certified 160-Point Vehicle Inspection by an ASE Certified Technician. We provide Carfax Vehicle History Reports, and are endorsed by AAA. We Back ‘em Better with a 3 Day Satisfaction Guarantee and a 12 Month/12,000 Mile Warranty. We Price ‘em Better with Certified Preferred Financing and Guaranteed Credit Approval. We have dedicated individuals searching the country for the highest quality, lowest priced vehicles for our inventory. Bad credit, no credit we have guaranteed financing! CARFAX One-Owner. 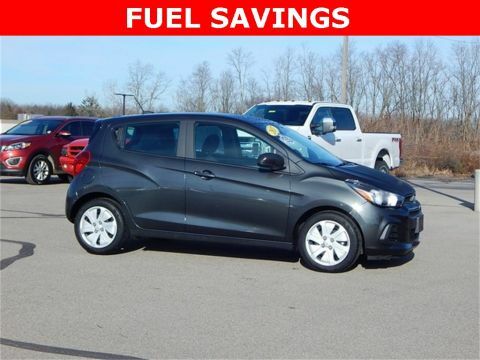 Nightfall Gray Metallic 2017 Chevrolet Spark LS 4D Hatchback FWD CVT 1.4L DOHC Odometer is 11642 miles below market average! 30/38 City/Highway MPG Awards: * 2017 KBB.com 5-Year Cost to Own Awards * 2017 KBB.com 10 Most Awarded Brands Why buy a Wetzel Better Buy Used Vehicle? We Check ‘em Better with a certified 160-Point Vehicle Inspection by an ASE Certified Technician. We provide Carfax Vehicle History Reports, and are endorsed by AAA. We Back ‘em Better with a 3 Day Satisfaction Guarantee and a 12 Month/12,000 Mile Warranty. We Price ‘em Better with Certified Preferred Financing and Guaranteed Credit Approval. We have dedicated individuals searching the country for the highest quality, lowest priced vehicles for our inventory. Bad credit, no credit we have guaranteed financing! Recent Arrival! **CLEAN CARFAX**, ONE OWNER, IMMACULATE CONDITION, BLUETOOTH HANDS FREE, NON SMOKER, **LOADED!! 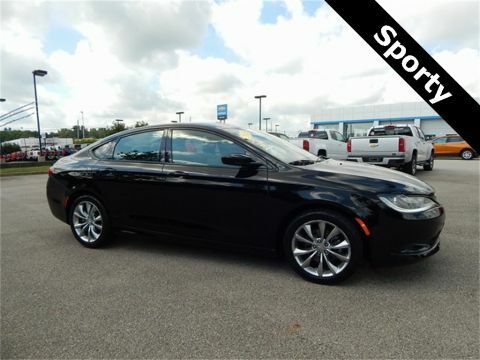 **, Locally Owned New Car Trade!, Power Moonroof, AWD, AWD, 17" x 6.5" Alloy Wheels, 4.44 Axle Ratio, 4-Wheel Disc Brakes, 7 Speakers, ABS brakes, Air Conditioning, AM/FM radio: XM, Automatic temperature control, Brake assist, CD player, Delay-off headlights, Dual front impact airbags, Dual front side impact airbags, Electronic Stability Control, Four wheel independent suspension, Front anti-roll bar, Front dual zone A/C, Front fog lights, Heated door mirrors, Heated front seats, Heated Reclining Front Bucket Seats, Leather-Trimmed Seats, Low tire pressure warning, MP3 decoder, Occupant sensing airbag, Overhead airbag, Panic alarm, Power door mirrors, Power driver seat, Power moonroof, Power steering, Power windows, Radio data system, Radio: AM/FM/CD Audio System w/XM Radio, Rear anti-roll bar, Rear window defroster, Rear window wiper, Remote keyless entry, Security system, Speed control, Speed-sensing steering, Speed-Sensitive Wipers, Steering wheel mounted audio controls, Traction control. CARFAX One-Owner. Clean CARFAX. 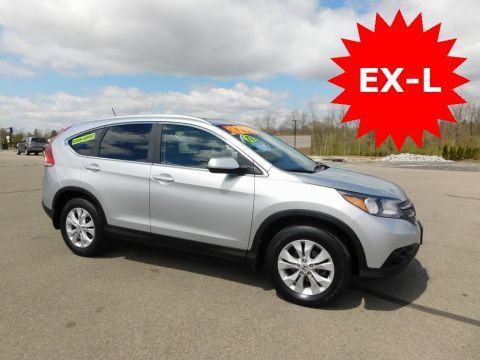 Polished Metal Metallic 2012 Honda CR-V EX-L 4D Sport Utility AWD 5-Speed Automatic 2.4L I4 DOHC 16V i-VTEC 22/30 City/Highway MPG Awards: * 2012 KBB.com Brand Image Awards 2016 Kelley Blue Book Brand Image Awards are based on the Brand Watch(tm) study from Kelley Blue Book Market Intelligence. Award calculated among non-luxury shoppers. For more information, visit www.kbb.com. Kelley Blue Book is a registered trademark of Kelley Blue Book Co., Inc. Full tank of gas, full detail, 3 day satisfaction guarantee. Recent Arrival! **CLEAN CARFAX**, IMMACULATE CONDITION, BLUETOOTH HANDS FREE, NON SMOKER, **LOADED!! **, Locally Owned New Car Trade!, Heated Leather Seats, Navigation/NAV/GPS, Power Moonroof, Blind Spot Detection, Lane Departure Warning, Back Up Camera, 4MATIC®, Black w/AMG Premium Leather Upholstery, 115V AC Power Outlet, 3.90 Axle Ratio, Air Conditioning, Alloy wheels, Automatic temperature control, Brake assist, COMAND® w/Navigation & Voice Control, Electronic Stability Control, Front dual zone A/C, harman/kardon® Logic 7® Surround Sound System, HD w/Sirius Satellite, iPod/MP3 Media Interface, iPod/MP3 Media Interface Cable, Power driver seat, Power Liftgate, Power moonroof, Power steering, Power windows, Premium I, Radio data system, Radio: COMAND® AM/FM/6-Disc DVD/CD Changer, Rear air conditioning, Rear window defroster, Rear-View Camera, Remote keyless entry, Steering wheel mounted audio controls, Weather band radio. 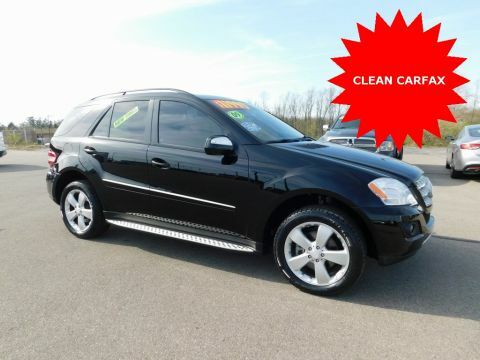 Obsidian Black Metallic 2009 Mercedes-Benz M-Class ML 350 4D Sport Utility 4MATIC® 7-Speed Automatic Electronic 3.5L V6 DOHC 24V Full tank of gas, full detail, 3 day satisfaction guarantee. **CLEAN CARFAX**, ONE OWNER, IMMACULATE CONDITION, Back Up Camera, AWD, AWD, 4-Wheel Disc Brakes, 6 Speakers, ABS brakes, Air Conditioning, Alloy wheels, AM/FM radio: SiriusXM, AM/FM Stereo/Single CD/MP3 Capable, Auto-dimming Rear-View mirror, Automatic temperature control, Brake assist, CD player, Delay-off headlights, Driver vanity mirror, Dual front impact airbags, Dual front side impact airbags, Electronic Stability Control, Exterior Parking Camera Rear, Four wheel independent suspension, Front anti-roll bar, Front Bucket Seats, Front Center Armrest, Front dual zone A/C, Low tire pressure warning, MP3 decoder, Occupant sensing airbag, Outside temperature display, Overhead airbag, Panic alarm, Passenger door bin, Passenger vanity mirror, Power driver seat, Power passenger seat, Power steering, Power windows, Radio data system, Rear anti-roll bar, Rear Parking Sensors, Rear window defroster, Remote keyless entry, Security system, Speed control, Speed-sensing steering, Speed-Sensitive Wipers, Split folding rear seat, Steering wheel mounted audio controls, SYNC w/MyFord, Tachometer, Traction control. CARFAX One-Owner. Clean CARFAX. 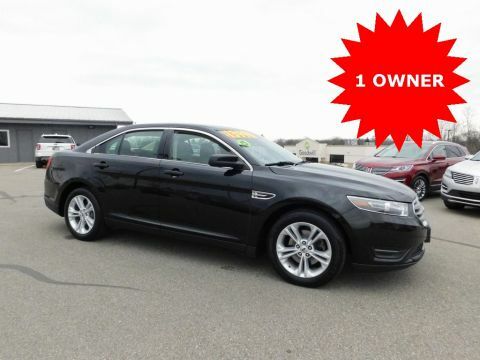 Black 2015 Ford Taurus SEL 4D Sedan AWD 6-Speed Automatic with Select-Shift 3.5L 6-Cylinder SMPI DOHC 18/26 City/Highway MPG Awards: * 2015 KBB.com Brand Image Awards Full tank of gas, full detail, 3 day satisfaction guarantee. Recent Arrival! IMMACULATE CONDITION, BLUETOOTH HANDS FREE, NON SMOKER, **LOADED!! 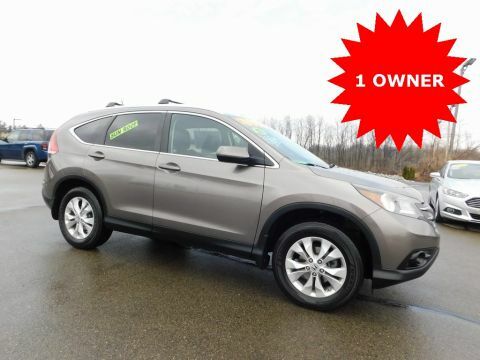 **, Locally Owned New Car Trade!, Heated Leather Seats, Power Moonroof, Back Up Camera, AWD, AWD, 4.44 Axle Ratio, 4-Wheel Disc Brakes, 7 Speakers, ABS brakes, Air Conditioning, All Season Floor Mats, All Season Protection Package, AM/FM radio: XM, Automatic temperature control, Brake assist, Cargo Tray, CD player, Delay-off headlights, Dual front impact airbags, Dual front side impact airbags, Electronic Stability Control, Four wheel independent suspension, Front anti-roll bar, Front dual zone A/C, Front fog lights, Low tire pressure warning, MP3 decoder, Occupant sensing airbag, Overhead airbag, Panic alarm, Power driver seat, Power moonroof, Power steering, Power windows, Protection Package, Radio data system, Radio: AM/FM/CD Audio System w/XM Radio, Rear anti-roll bar, Rear window defroster, Remote keyless entry, Security system, Speed control, Speed-sensing steering, Splash Guards, Steering wheel mounted audio controls, Traction control, Wheel Locks. Alabaster Silver Metallic 2013 Honda CR-V EX-L 4D Sport Utility AWD 5-Speed Automatic 2.4L I4 DOHC 16V i-VTEC 22/30 City/Highway MPG Awards: * 2013 KBB.com Brand Image Awards 2016 Kelley Blue Book Brand Image Awards are based on the Brand Watch(tm) study from Kelley Blue Book Market Intelligence. Award calculated among non-luxury shoppers. For more information, visit www.kbb.com. Kelley Blue Book is a registered trademark of Kelley Blue Book Co., Inc. Full tank of gas, full detail, 3 day satisfaction guarantee.